The Freedom From Religion Foundation is rebuking a Maryland school district for offering constitutionally indigestible material to its children during lunch. A concerned parent contacted FFRF to report that Jarrettsville Elementary School (in Jarrettsville, Md.) displays a portion of the Lord’s Prayer on a large plaque in its cafeteria. 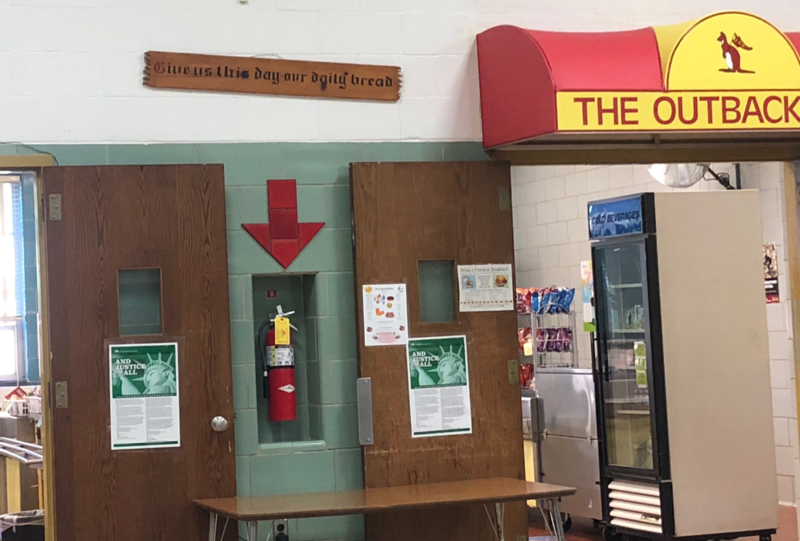 Between the doors where students pass to receive their lunch, a wooden sign, approximately 3 feet wide by 6 inches tall, reads “Give us this day our daily bread” in old English style lettering. This phrase is from Matthew 6:11 in the New Testament. The sign apparently faces out to the main dining area so that it can be seen from across the cafeteria. FFRF has asked the school district to remove this sign to comply with the Establishment Clause of the First Amendment. Courts have continually held that school districts may not display religious messages or iconography in public schools, FFRF reminds Harford County Public Schools. Consequently, elementary school students should not have to view materials promoting a Christian or any other religious message. There is no educational or academic component or motive for such postings; their presence is proselytizing to a captive audience. Students could very well infer from the plaque that Jarrettsville Elementary School has a preference for religion over nonreligion — and in this case Christianity over other faiths. The district has an obligation to ensure that its schools are welcoming to all students, not just those in the Christian majority. The Freedom From Religion Foundation is a national nonprofit organization with 32,000 members across the country, including nearly 600 in Maryland. Its purposes are to protect the constitutional principle of separation between state and church, and to educate the public on matters relating to nontheism.